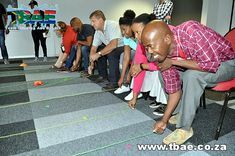 TBAE recently had the honor of facilitating and coordinating Nedbank’s Minute to Win It team building event in Johannesburg. 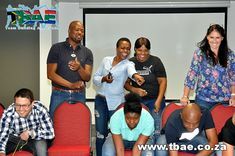 The event took place at the Sand River Guest House in the Rivonia suburb of Johannesburg. Nedbank is one of South Africa’s largest banks and has its headquarters in Sandton, Johannesburg. The Nedbank Group actively seeks out and pursues opportunities to help communities, develop and grow small businesses, foster job creation opportunities and contribute to the overall development of a sustainable and strong social system in South Africa. Nedbank has earned the reputation of being a leader in sponsorship marketing being prominent in sectors such as golf, soccer, road running, sport for people with disabilities and various strategic sponsorships. The venue for this team building event was the tranquil setting of the Sand River Guest House in Johannesburg. This venue is ideally located within walking distance of the Rivonia business centre where you will find banks, hairdressers, shops and restaurants. Sandton City, Fourways and Monte Casino are a mere fifteen minute drive from the venue. The Sand River Guest House has a beautiful grass area surrounded by trees and overlooking the river. 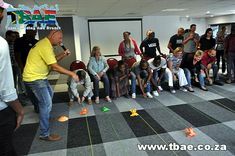 This area is ideal for outdoor team building events such as Amazing Race, Corporate Fun Day, Sports Day and Tribal Survivor. The Sand River Guest House also offers indoor team building facilities in the form of an air-conditioned meeting room. The room seats 10 delegates around a boardroom table or 15 delegates seated in cinema style. 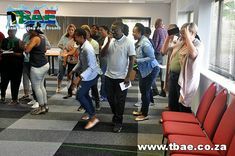 Indoor team building events such as Art Workshops, Minute to Win It, Noot vir Noot and Drumming can be held here for smaller groups. 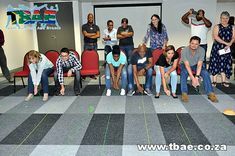 Nedbank’s Minute to Win It event took place in this meeting room. 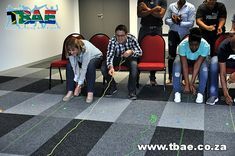 TBAE’s Minute to Win It team building activity is based on the Minute to Win It television series. 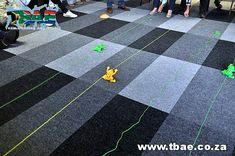 Participants have to complete various activities within a minute with the difficulty level of the activities increasing as the game progresses. Common household products such as plastic cups, cd’s, nails, cookies and even pantyhose are used to complete certain tasks. 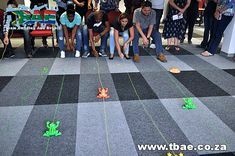 This is an extremely fun event and causes lot laughter with crazy activities such as Back Flip, Dizzy Mummy, Elephant March, Face the Cookie, Penny Hose and Spoon Frog. Minute to Win It is a popular game show where contestants take part in a series of 60-second challenges using objects that are commonly available around the house. 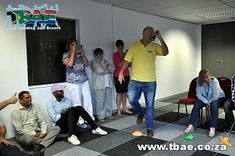 Minute to Win It is also a fun team building activity for the office. Here are some of the challenges that the contestants are faced with when they compete in the Minute to Win It show. A Bit Dicey – The contestant must stack six dice on a Popsicle stick held in their mouth and balance them for three seconds. Baby Rattle – The contestant must transfer 274 gumballs from one two-liter bottle to the other by shaking them. This must be done with each of the two bottles held in both hands. 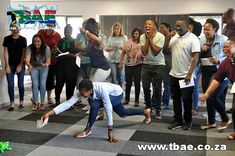 Bite Me – The contestant must grab different sized paper bags, in order from largest to smallest, in their mouth and place them on a table without using any body part except the feet for balance. The size of the bags goes down by increments of 5.1 cm. Blow Ball – The contestant must blow 73 red Ping-Pong balls off of a large pizza platter without knocking off the three yellow Ping-Pong balls scattered in the mess of red Ping-Pong balls. Booby Trap – The contestant must bounce a ping pong ball in an attempt to knock a potato chip can leaning diagonally on a glass bottle down so the chip can falls, containing the bottle inside the can. This must be done three out of five times. Bottoms Up – The contestant must use a yo-yo attached to their back to knock over four or six empty soda cans on pedestals. Bulb Balance – The contestant must balance two eggs upright on light bulbs using only one or two unopened packets of salt to stabilize the eggs. By a Thread – The contestant must use one hand to run a piece of thread through the eye of ten needles, each one with a smaller eye than the previous. 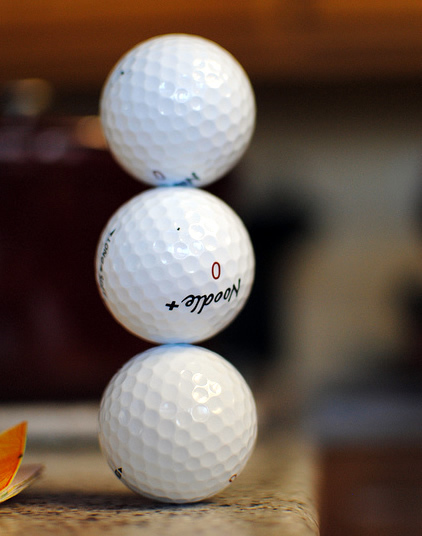 Caddy Stack – The contestant must stack three golf balls on the table. The stack must remain in place for three seconds in order for the contestant to complete the challenge. CD Dominoes – The contestant must line up 20 CD cases around a shot glass (or red sticker) in a way that, when one is blown over (or lightly tapped), all of them fall and the final case in the series falls into a bucket located next to the contestant. Chop Stack – Using a pair of chopsticks, the contestant must stack four lip balm containers on top of each other. The tower must stay standing for three seconds in order to count. Cappuccino – The contestant must drop a coffee cup on its side to land it in an upright position and then bounce a ping pong ball into the cup. Dizzy Mummy – The contestant must unroll a toilet paper roll by executing 360-degree spins. Their fists must be closed at all times. The contestant fails the challenge if the toilet paper rips. Egg Dance – The contestant must carry two eggs on inverted plates across the stage from one set of platforms to the other. The contestant fails the challenge if either egg drops. Egg Roll – The contestant must fan two or three raw eggs with a pizza box into a pre-determined zone on the other side of the stage. The contestant fails the challenge if an egg rolls off the circular part of the stage or the egg cracks. Fish Head – The blindfolded contestant must place a lampshade attached to a fishing pole on their head, and it must stay for three seconds. Give it a Whirl – The contestant must spin and transport three marbles in an upside-down wine glass from one stool to a small bowl on the other. Hangnails – The contestant must hang six nails concurrently on a taut string. Hoop De Loop – The contestant must roll hula hoop across the stage so that they come to rest surrounding a full two-liter soda bottle. There are seven bottles, and they must surround three. They must remain there for three seconds. Iron Board Man – The contestants must work together to guide a marble down a metal ironing board with its legs extended and into one of three middle holes. Junk in the Trunk – With an empty tissue box attached to their waist, the contestant must shake eight ping pong balls out of the box without using their hands. Just Hang On – The contestant must balance 4 wire coat hangers by the tips of their hooks on a 1 mm thick nylon string. All the hangers must remain for three seconds to count. Keep it Up – The contestant must keep two feathers in the air using only their breath for 60 seconds. The contestant fails the challenge if the feathers touch the body or the ground, or if the contestant goes out of the stage. Magic Carpet Ride – The contestant must sit on and move a bath mat using the inchworm technique to navigate around three obstacles and back to the finish line. Maze Craze – The contestant must maneuver a marble on top of a board through a maze consisting of rubber bands stretched around screws. If a marble falls off the board, the contestant may use a new one. Nice Build – The contestants must work together to create a three-tiered tower using 15 reams of paper. Nimble Thimble – Player must bounce a marble into each of six thimbles. Nose Dive – The player must transfer five or six cotton balls, one at a time from one serving bowl to another using only petroleum jelly on the nose. Office Tennis – The contestants must rally a crumbled up piece of paper back and forth using clipboards to land it in a trash can across the stage. Paper Dragon – The contestant must unroll two rolls of party streamers with only their hands and arms. Pink Elephant – The contestant must swing their head around in an attempt to retract a forehead mounted Slinky. Pop Top – 48 bottle caps are placed on a round table top, and, using a single thumb, the contestant must flick one of these caps into a cup in the center of the table. Rapid Fire – The contestant must shoot rubber bands to knock a triangle stack of six cans totally off a platform. Roll With It – The contestant must un-spool two rolls of toilet paper at the same time. If the roll breaks, they pick it back up. They must use one hand for each roll. Spare Me – The contestant must drop marbles down a pool noodle to knock over ten upright markers from 16 feet (4.9 m) away. Spoon Frog – The contestant must use spoons to catapult three other spoons into glasses. Stack Attack – The contestant must stack 36 cups in a pyramid form and then deconstruct it by sliding the cups down diagonally, and stacking the resulting piles into one giant stack, as it started in. Tear It Up – The contestant must shoot rubber bands at a hanging roll of toilet paper with an empty soda can attached to the end, so that the toilet paper rips and the can falls to the floor. Tuna Roll – The contestant must roll tuna cans around a two-by-four wood piece to knock over four inverted 2-liter soda bottles placed in a 2×2 formation. Uphill Battle – The contestant must keep three marbles on a slanted table for 60 seconds using a back of a spoon. The contestant fails the challenge if any of the marbles falls off the table. Worm Diving – The contestant, using a moist Gummy Worm as “bait”, must fish a pretzel out of a fishbowl full of them, bring the pretzel to their mouth, and eat the pretzel without using their hands or dropping the pretzel. Yank Me – The contestant must place four cups upside down on a table, each cup with an index card over it. They must then yank out the index cards so that the cups collapse into a four cup stack. If it falls over, it may be restacked. What are some of your favourite Minute to Win It challenges that have not been mentioned here.